The lovely village of Rocamadour is on the eastern edge of the area, across the border from the Dordogne into the Lot department. 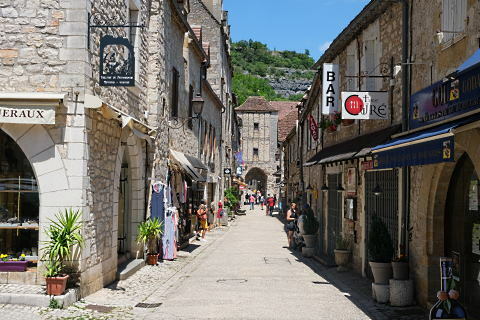 Each year the small village of Rocamadour (population around 600), in the Parc Naturel Régional des Causses du Quercy, receives more than a million visitors. Why so popular? The second reason is because of the beautiful and dramatic setting of the village, climbing up a cliff side. Rocamadour is one of the Grand Sites of France. It was also voted 'the favourite village of the French 2016' by viewers of a French television channel. It is also a UNESCO World Heritage Site as part of the pilgrim route of the 'Way of Saint James'. 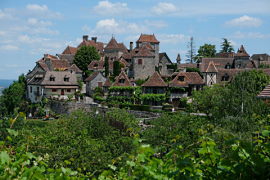 Rocamadour is one of France's most important tourist destinations. Rocamadour has several highlights well worth exploring, although it is the 'village as a perfect unity' which is really the big attraction. The village clings to the cliff side above the river Alzou and is so picture perfect it is quite breathtaking. For the best views of the village in its entirety go to l'Hospitalet. 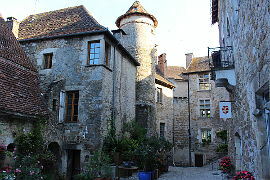 As the village hugs the cliff it mainly consists of one long narrow paved street, the Rue de la Couronnerie, lined with medieval houses, several of which are notable and many of which are impressive, and entered by stone fortified gateways. The Porte du Figuier and the Porte Salmon are the two main gateways. From the Rue de la Couronnerie you get to a series of monumental steps called the Grand Escalier. These lead to a small square surrounded by 8 important religious buildings. There are 216 steps in total, once climbed by pilgrims on their knees. If you can persuade your children to climb all the way up the Grand Escalier without complaining you are doing a fine job! A small chapel was built in the cliffside in 1105 and in 1112 the abbot of Tulle came to live here and in 1148 a first miracle was announced and pilgrims started arriving. Money from the pilgrims financed the building of a large basilica , the basilica Saint-Saveur and then further religious buildings were built also in this relatively small space. The religious buildings here inclue the Chapelle Notre Dame which is home to the Black Madonna; the basilica Saint-Sauveur; the Saint-Michel chapel and the Palace of the Bishops (Palais des Eveques) and several chapels. The statue of the Black Madonna was the main draw for the pilgrims. In the same chapel is the miraculous bell reputed to ring when a miracle occurs at sea and a sailors life is saved. 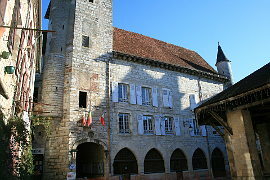 Famous pilgrims who have journeyed to Rocamadour include Henri II of England, Eleanor of Aquitaine, Louis IX of France, Charles IV of France and Louis XI of France. If you still have some energy (or have taken the lift rather than walked) continue onwards and upwards along the shady path towards L'Hospitalet, final destination for the pilgrims and a great place for some stunning views across the region. 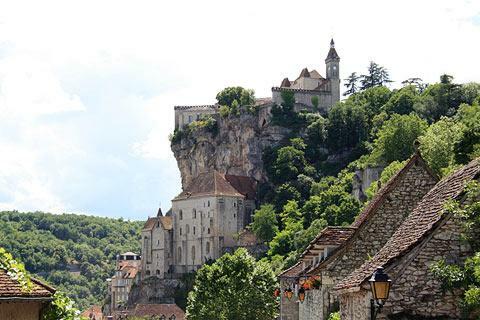 It has to be admitted that a million visitors a year to a small village means that Rocamadour is very often over busy, and you should visit early morning or out of season if at all possible. 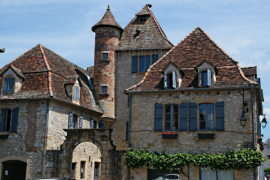 But crowds or not, it remains unmissable if you are in this part of the Dordogne / Lot region. Once you have explored the religious buildings take some time ambling down the main street. It is full of cafes, restaurants and some interesting little shops. 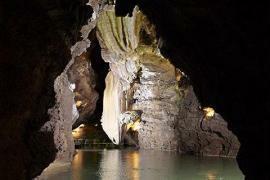 Not to be missed near to Rocamadour are the Gouffre de Padirac - one of our favourite caves in France. Also practically within the village itself, the caves at 'Grotte Prehistorique des Merveilles' are popular for both the rock formations and the 20,000 year old cave paintings they contain (entrance 100 metres from the Rocamadour tourist office). These are open April to November, 10.00-12.00 and 14.00-17.00 and 9.30-19.00 in July and August. The visit takes about 40 minutes. 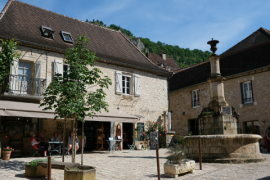 Also in Rocamadour is the 'Maison des Abeilles', the Bee house, where you can learn about the historical importance of bee-keeping in the region. If you are travelling with children the Foret des Singes at Rocamadour is a forest where more than 100 monkeys live in relative freedom. Wandering through the park there are various opportunites to observe the monkeys close up. 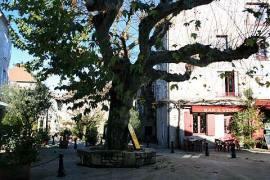 The most beautiful villages of Loubressac and Carennac are close to Rocamadour as is the wonderful town of Martel. The lovely town of Martel is nearby. With its seven towers and lovely square with a large stone market hall and the Palais de la Raymondi there is a lot of beautiful architecture to admire. You can also take the scenic train ride on a steam train from Martel to Saint-Denis for some magnificent views of the Haut-Quercy. Visit on a Wednesday or Saturday morning to take advantage of the lively market.